Gearbox output shafts are 303 stainless steel. Frame, endshields, armature and interior components protected by enamel and polyestercompounds for resistance to moisture, acids, alkalies and oil. Cast conduit box with threaded conduit holes and nitrile gaskets keep water out. The conduit box cover is made from 304 stainless steel. For any condensation that may accumulate inside the motor, a one-way stainless steel vapor vent is provided. All hardware is stainless steel. Motor is painted with white epoxy for superior corrosion resistance and protection. Machined fits between the endbells and motorframe are sealed with gaskets. Thru-bolt heads and nuts are sealed with fiber washers. O-rings are fitted under each threaded brush cover. This worm-type right-angle gearing features hardened, steel worm with bronze worm wheel for long life and quiet operation. Precision machined aluminum housings are used. Gearbox has all ball bearings. The housing is sealed and lubrication is permanent with an oil bath. 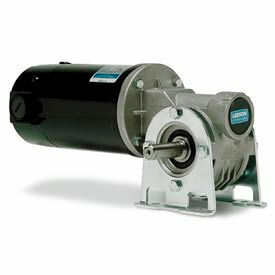 DC permanent magnet gearmotors are rated for continuous duty. Designed for use with full wave non-filtered SCR controls or battery supplied low voltage for adjustable speed applications requiring constant torque throughout the speed range. These Washguard motors are designed for extended life in applications requiring regular washdown or otherwise wet environments. Washguared motors retard the entrance of water. Extra protection for the motor's interior prevents rust and corrosion build-up and releases trapped moisture to provide a longer life. 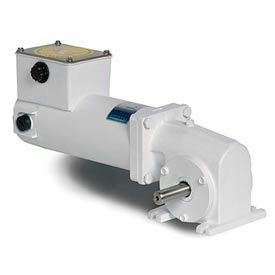 For optimum seal life, these right-angle gearmotors have a lubrication breather positioned for horizontal mounting. For other mountings, the breather plug must be reoriented by using a 90 degree 1/8 NPT taper pipe elbow. Overhung load capacities shown are at center of the output shaft.The motor's stall torque exceeds recommended full load torques for the gearboxes. A current limiting device should be used to prevent damage to the gear sets. Worm-type right-angle gearing features hardened, steel worm with bronze worm wheel for long life and quiet operation. Single-piece die cast aluminum alloy housing is vacuum impregnated with Resinol for protection and sealing. This gearbox combines light weight with high tensile strength along with precision machining for alignment of bearings and gearing. For optimum seal life, high-temperature nitrile seals are used. Gearbox provided with solid output shaft, but can be converted to a hollow output shaft mounting by using snap-ring pliers and removing the snap ring and solid output shaft. Also the T-base feet are bolted to the gearbox, but can easily be removed and converted to face mounting. SCR rated 90 volt motors are performance matched for continuous service over a 60:1 speed range. All have constant torque throughout the speed range when powered by a full-wave, unfiltered SCR-type 115 volt input adjustable speed control having atypical form factor of 1.3 to 1.4. The low voltage (12V) motors are also performance matched for continuous duty. Motors are designed for battery power or can be used with a low voltage controller with form factor up to 1.05.